Hague for prime minister? According to one of the wilder Tory theories, a hung parliament could force a humiliated Cameron from office and put the trusted Hague into Number 10 at the head of a coalition government. On today’s showing Hague has lost his hunger for power. 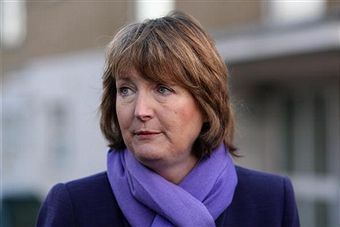 With Brown in Northern Ireland on Superman duty, Hague was pressed into service against Harriet Harman. The leader of the house arrived in a stiff tunic of imperial purple decorated with a butterfly brooch whose winged shape divided opinion. To some it suggested a phoenix-from-the-flames, to others a W-shaped recession. Hague had no trouble dominating her at PMQs. And because he knew he’d have no trouble, he took no trouble either. He was relaxed and fluent. His arguments were subtle and well-crafted but the gladiatorial muscle, the street-fighting wit has deserted him. The Hague high style is a thing of the past. He seemed satisfied to score a few decent points about Brown’s economic record. The prime minister, he said, had created a regulation system that failed. He should follow Obama’s example and divide retail from corporate banking. And he should ditch his stillborn Tobin tax which lacks international support and has been ridiculed by the Bank of England. In reply Hattie called America’s president as a defence witness. ‘One thing we agree with Obama on is that we need a fiscal stimulus.’ Hague observed two weaknesses in this argument. ‘President Obama has announced a freeze on spending,’ he said. ‘And this government has just raised VAT.’ This was fun, sort of, but the sport was marred by Hattie’s poor grasp of finance. Victory is too easy. What gets Hattie going is social equality. And it warms up Vince Cable as well. Taking Nick Clegg’s place today, the able Mr Cable congratulated Hattie for establishing the panel which has just reported on social inequality. By one scale of measurement, the ‘shocking’ inequality created by 18 years of Tory government remains just as ‘shocking’ after 13 years of Labour policies. Hattie gave two replies. First she said ‘growing inequality has been stemmed.’ Then she claimed the government had ‘narrowed inequality.’ These claims aren’t entirely consistent. But when it comes to this topic the only certainty is that Harriet won’t let it go. As an equality-obsessive she has no equal. And her horse-blinkers led her into trouble today. David Jones quoted Mandy’s celebrated reflection on ‘people getting filthy rich’ and he asked if Hattie was ‘intensely relaxed about the prime minister’s predecessor doing the same.’ Poor old Hattie didn’t get the joke. As the Tories fell about laughing she pressed home the government’s determination to support social mobility. There was so much laughter the Speaker had to call things to order. And when Hattie resumed she still had no idea why everyone was laughing and plugged away at the same point, apparently invoking Tony Blair as the perfect example of a social reject raised to opulence by the Labour party. She enjoyed a redeeming moment when Brian Iddon (Lab, Backbench Plant) wondered how science teaching would be affected by Conservative plans to exclude graduates with bad degrees from the profession. ‘I would urge my friend not to worry,’ said Hattie, ‘because like so many other policies it will probably be changed by this afternoon.’ Sparse chuckles greeted this. The house seemed half empty today as MPs elected to put Hattie’s social mobility agenda into practice. They’d become mobile and were elsewhere being social.